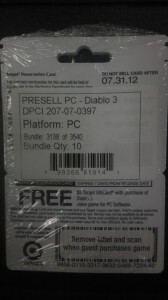 Thanks to a reader by the name of Josh for sending us the following two pics, showing front and back photos of a bundle of Diablo III reservation cards he sighted at his local Target store. Going by Target.com, their pricing is standard. 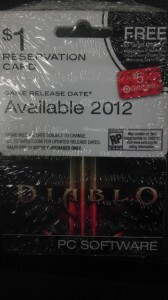 D3 is $60 and the D3CE is $100, but hey look, they’ve got Diablo III t-shirts for $10, or 3/$25, which is a damn good deal. Who knew? These game reservation cards don’t really mean anything, but viewing them is still strangely alluring, and not just for the $5 gift card with purchase. It smells like progress. Sign of Release! Were there any CE Presale cards seen? Target.com really irks me. It won’t show their shipping prices until you enter all of your shipping and billing information and are ready to order. And they’re high ($8.99 if you want to get 3 shirts). Ugh. Pass. dang just left target then came home and sceen the shirt! but i did go to jc pennys in clackamas oregon and i got http://www.jinx.com/p/diablo_iii_tyrael.html?catid=&s=diablo this shirt for 5 bucks!! pshhh…i saw these weeks ago at target. 3 Shirts for for $25? They’re $30 at our local eb games in Australia lol… I think my collectors edition will end up costing me roughly $140. I work at target….We had them up for sale the two weeks before they announced the release date. And if anyone wants to know….those reserve cards are for the standard edition only. We only receive maybe 3 or 4 collectors editions of any game. first come first serve. I honestly dont even think we will have the Collectors. but if we do. most likely it will be a very small amount of them.